You will earn 56.53 Reward Points. Earn 1 reward point for every 1 dollar spent. 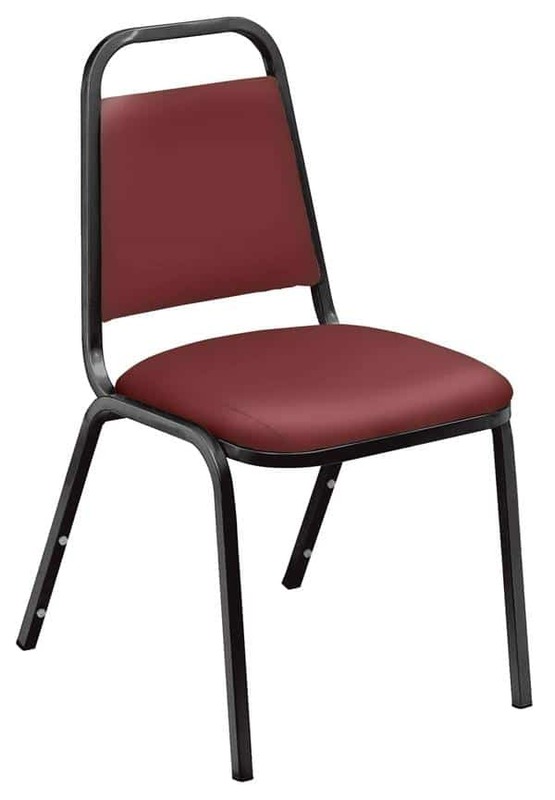 Fine seating at a fantastic price when you add the 9100 Series upholstered Value Stacker to any venue. This affordable stack chair brandishes a 1.5"-thick, pullover-style, foam-padded cushion covered with thick easy-to-clean vinyl. Plywood core within both the seat and tapered backrest which features a built-in handle for easy moving and stacking. A mighty 19-gauge square tubular steel frame includes under-seat bars to provide excellent support along with plastic glides to avoid marring floor surfaces. Safely stack up to 10 chairs, each with eight plastic bumpers attached to protect its attractive black powder-coated paint finish from scratching.